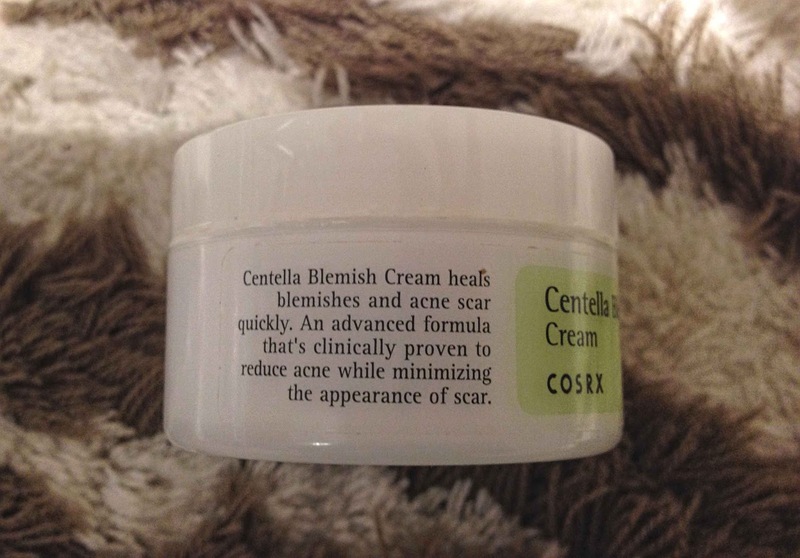 I'm back again with yet another Cosrx product review, the COSRX Centella Blemish cream. Acne isn't my main concern anymore, but I still need spot treatments to prevent occasional hormonal breakouts and random pimples. Cosrx products are for me like the 'all time safe' choices, if I have the feeling like my skin is out of balance (breakouts, dryness etc) I can always count on Cosrx products to restore my skin, with ingredients such as snail, propolis, hyaluronic acid, aloe, BHA, and AHA. 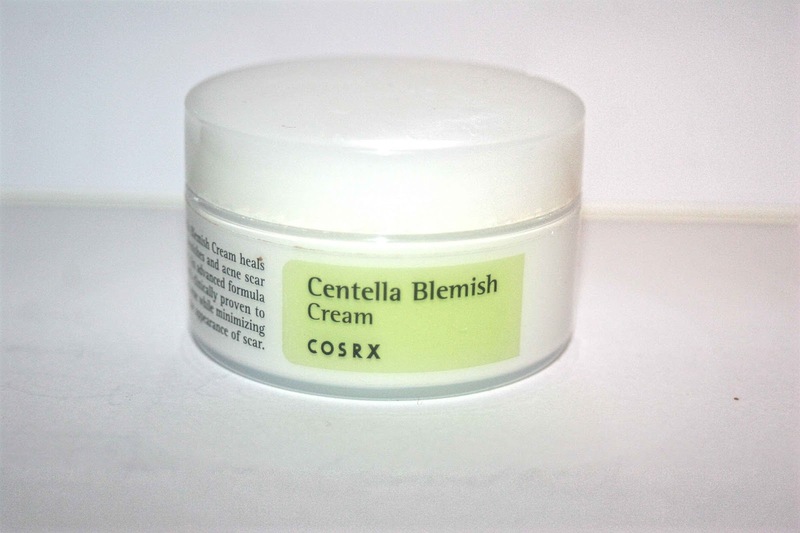 According to the brand the Cosrx Centella Blemish cream is a multi purpose product that can be used as a spot treatment, to fade acne scars, and alleviate skin after extractions of whiteheads and blackheads. - acne scars/PIH are my main concern, I use vitamin C, niacinamide and chemical exfoliating to fade them. - I don't do extractions myself because my skin gets red and inflamed very easy, but sometimes some blackheads want to 'get out' and I kind of help them lol, so a cream to calm down and prevent sounds nice. 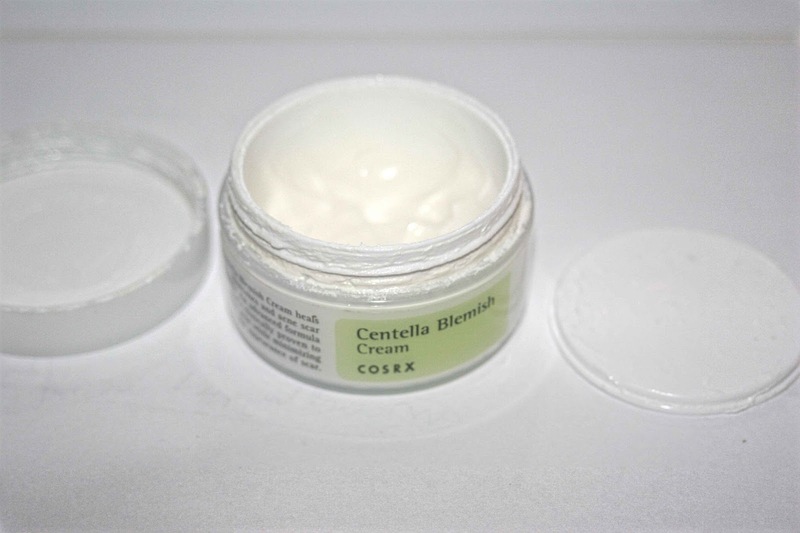 Cosrx product description: Centella Blemish Cream is a non-oily, hydrating, ointment-type cream that creates a protective barrier for the skin while the all-natural active ingredients clear and sooth the skin free from blemishes. A fast acting spot treatment cream, zinc oxide and centella asiatica leaf water hepls healing of blemishes and breakouts. Cosdna analysis shows no major red flags, Cetearyl Alcohol scores a 2 on acne but is further down the list. Don't rely to much on cosdna analysis, every skin reacts different to ingredients and formulation is also very important. The star ingredient here is Centella asiatica. Centella asiatica has been shown to be effective in wound healing, treating scars and stimulating synthesis of collagen, hyaluronic acid and cell growth factors, thus helping to maintain and restore skin elasticity. It also protects the skin from UV damage, likely by activating antioxidant synthesis. Hence, has an anti-aging, acne and healing function in skincare. The cream come in a simple white jar, packaging is typically Cosrx. There is 30 ml of product, which is not much if you plan to use it regularly on your entire face. However, it's described as a spot treatment so should be enough for treating small skin areas. I use the cream as advised after cleansing, toning and first serum step, applying it on a cyst, whitehead, irritated red bumps, or a local breakout. The texture of the cream is very thick but soft at the same time, almost difficult to spread it out but absorption is fast. The cream doesn't feel oily or heavy on my skin. As with all new products, I first patch tested it during my PM skin care routine, and it didn't cause any negative reaction. I later tried it for different skin concerns, without using any other spot treatment to test it's claims. - I used it on a deep cyst on my cheek that just started to form, I was surprised to see a reduction in size of the painful cyst. It wasn't completely gone and took a week to disappears, but the cyst never came to head and never increased further in size. - for some reasons (environment, hormonal) my skin is very prone to rashes, they manifest as small red bumps mainly on my forehead. I can experience them a few times a week. When I applied the Cosrx centella blemish cream on the affected areas a few times, red bumps were smaller and some entirely gone. - the blemish cream is also effective against whiteheads. I tested it as spot treatment on some whiteheads, they don't disappear immediately, but will be gone in two days without scarring and inflammation. - you know when you have the feeling that a pimple is about to pop up and your skin is slightly red in that area ..? 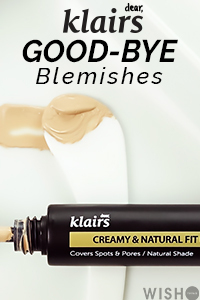 Well, it seems that the blemish cream stopped that from happening. I really like to use it for preventing acne, when I have the feeling that some pimples are about to form. 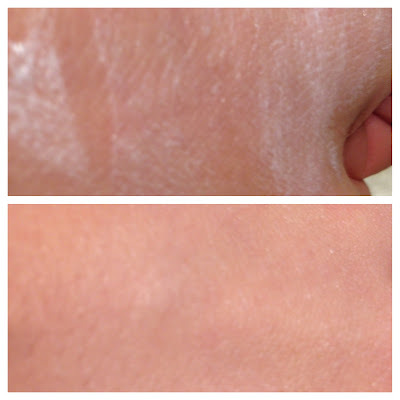 - I haven't seen any PIH fading while using the cream now for about a month. Still, one month isn't long enough and I use it more as a spot treatment, so I didn't even expect to see changes in acne scarring. - The cream is a little bit to thick to use it on my entire face, and there is only 30 ml of product. The moisturizing level is okay but not enough for my dehydrated skin. Could be a perfect moisturizing blemish cream for oily skin types, there is also a mattifying effect and the cream prevents and heals acne. 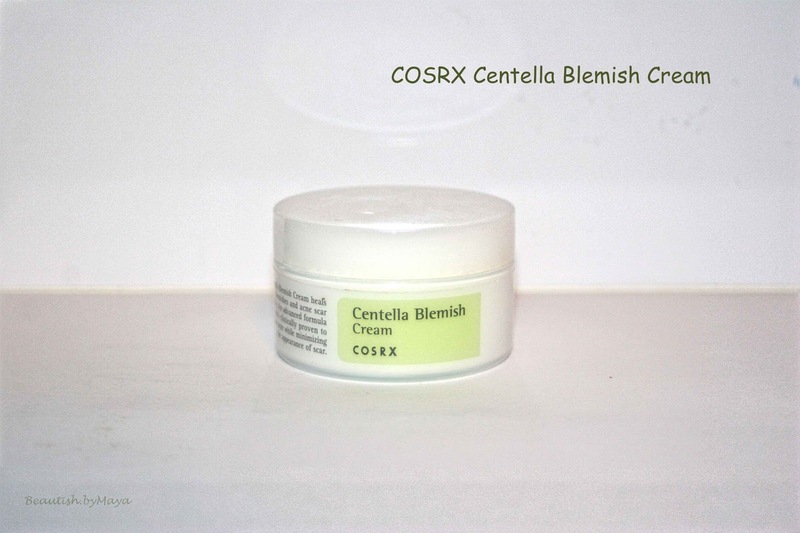 The Cosrx Centerella Blemish Cream does a good job at treating acne, including cysts and pimples. This product prevents and treats blemishes, it's also effective for healing and reducing inflammation. My skin is to dehydrated to use this as a regular moisturizer, but I imagine it to be moisturizing enough for oily skin. I didn't see any reduction in PIH, but I used it more as a spot treatment for blemishes. The blemish cream doesn't replace my regular spot treatments (pink powder, pimple stickers..) but it's a nice addition to my routine, and can be used under make up. Don't expect the results to be immediate visible, I find it more of healing, claiming and preventing treatment rather than a SOS spot treatment. I don't really suffer from regular acne so it's not a must have product for me, but a nice addition to my skincare routine and a good alternative to other harsh spot treatments. If you have oily- combination skin and acne is one of your main concerns, this blemish cream could be perfect for you. Overall, as always Cosrx didn't disappoint me, their products work good on my sensitive skin, are effective and affordable. I did my black Friday shopping yesterday and discovered that Wishtrend is selling a Cosrx wish box* for 58$ now, with products valued of 90$ (the Centella blemish cream included). It's a very good deal, I already own all the products in the box, otherwise I wouldn't have been able to resist the deal. The Cosrx blemish cream is available at Wishtrend* here for 17$, on Jolse for 17$, on amazon for 18$*, and koreandepart for 19$. There are also many ebay sellers selling the product. * This post contains affiliate links (with *), shopping with them supports the blog. Wow this sounds so amazing! Thank you for the review! That actually sounds like something I would like. Cystic spots are my biggest issue, along with the red marks they leave behind when they are finally gone. This looks really interesting! Great post! This sounds really good but I must admit that i am not familiar with this brand at all. I have heard of Wishtrend and signed up as their affiliate although I never did use the site and in the end, never did place the banner on my blog. Have you purchase anything from the site before? Yes I'm a regular user of wishtrend, they do have a nice selection of some products, they is a free shipping option and sales, boxes etc. I buy some of my cosrx products there and the C21.5 serum!! This sounds like a really good product and good to know that it works! I'm adding this to my new Jolse order. Currently waiting on two Jolse orders, a RRS and a Sasa order. Haha lol, and have you tried it? Ohhhh. Now I finally realized what those red bumps I would get were! They were rashes. I would also get those little red bumps which are not quite pimples and disappear the next day. They usually develop throughout the day. I guess its environmental because of the constant heat and the dirty, polluted air I'm exposed to. That's sounds great! My skin is prone to having whiteheads more than blackhead which is a pain since they collects in my pores and produces acne the next day.. I will definitely check this one out! If you have sensitive skin, then commonly it's advised to use pimple cure cream. These do however have the potential to cause permanent skin damage when poorly administered,Emily Blunt Skin Care and they are also expensive. These are only useful in the treatment of age spots, wrinkles and fine lines. I consider Revitol skin break out cream to be a standout amongst the best creams,find out this here as it truly functioned admirably for me and the extraordinary greater part of my companions.